Bugbears are hairy goblinoids born for battle and mayhem. They survive by raiding and hunting, but are fond of setting ambushes and fleeing when outmatched. This medium muscular, savage humanoid stands 7 feet tall. Coarse hair covers most of its body. Its mouth is full of long, sharp fangs, and its nose is much like that of a bear. That would be very helpful Hsan. So... 2d8+2 damage for the Morningstar? A regular morningstar does 1d8 damage. I'm guessing this is not an error (it'd have come up a long time ago) but... How do I explain to a fighter who just looted this morningstar that it's only going to do half the damage in his capable hands? The Bugbear's ability allows him to do the extra 1d8 damage. It's the bad guy's skill not the weapon. I agree. 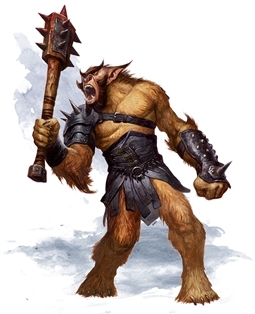 Also, given all the great content in Volo's, I'm disappointed that there seems to be no stat blocks for the Bugbear Special Forces mentioned in the Goblinoid Lore. They sound really cool. I agree, I just read a little bit about Bugbear's and the two brother gods they follow. There is so much more to a Bugbear. Thanks for the extra immersion RickAJr! For me the Bugbear is one of THE CLASSIC monsters. Ive been using Bugbears in campaigns forever. Thought these guys had reach ? I know this is late, but you don’t have to explain anything. A weapon is a tool, its damage is indicative of the wielder. The extra damage from the bugbear could just be its brute strength—your fighter doesn’t know one way or another.